As we’ve already discovered, 1962 is rich with history and the people of that age, and indeed any age, enjoyed the simple act of eating. Eating, particularly at restaurants, brings us together as a race and as a culture. It is not only essential to our continued existence physically, but goes a long way to ensure our fulfillment spiritually. Our road trip is only a Roadtip-’62 ™ trip when eating at restaurants that were around in good old ’62, so here is an introduction to a handful of classic/historic restaurants that have been around since at least 1962. Opened in 1935 and one of Los Angeles, California’s oldest cafeteria-style eating establishments, as well as being the largest public cafeteria in the world, Clifton’s really is a piece of history. Founded by Clifford Clinton, the restaurant’s name is actually a portmanteau of its founder’s – with the first half being "Clif-" from "Clifford" and the latter being the "-ton" from "Clinton". A strong believer in being kind to others, the restaurant – like its owner – would never turn away anyone who was hungry, offering a credo of "Dine Free Unless Delighted" – a policy which came into its own during the Depression. This was a tough time to operate a catering business due to the high cost of catering van insurance, rent, and banking at this time of low incomes. Clifton’s Cafeteria is currently being restored to its former interior glory, while installing modern restaurant equipment. Entrepreneur Andrew Meieran purchased Clifton’s Brookdale Cafeteria in downtown LA in 2010. He is working with the Los Angeles Conservancy to rejuvenate the building. One of the first things changed was the removal of the 1963 aluminum façade: the exterior will be restored to approximate what we might have seen in 1962. Located at 648 South Broadway, Los Angeles, California, it’s less than a ½ mile off old US-6. When we make it to the end of our trip on US-6, it should be on the list of places worth trying. A widely-renowned BBQ joint in Savannah, Georgia, Johnny Harris was founded in 1924 – ostensibly by the eponymous Mr. Harris himself, as a combined effort with a Mr. Kermit "Red" Donaldson who joined a few years later. Initially set up as a place where everyone could enjoy sumptuous feasts of the barbecued variety, it quickly spiraled into something resembling a massive restaurant-based success, with the sauce in particular being a signature Johnny Harris item. The sauce itself had proven so popular, that it was sold in empty leftover soda bottles, eventually proving to be such a success that it was incorporated into the business proper. If you can’t make it down there yourself, don’t forget to order some of their barbecue sauce. 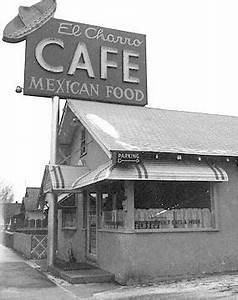 Tucson, Arizona based and founded in 1922, the El Charro café cites itself as "the oldest restaurant in the territory under continuous family ownership" as well as being widely regarded as actually being the oldest Mexican restaurant in the entire US. The El Charro story was begun by one Monica Flin, the daughter of an immigrant French mason, who – perhaps rather oddly for a French person – had found herself to be quite gifted when it came to preparing Mexican cuisine. At the time of opening, the restaurant consisted of a narrow, one-room premises from which she served her dishes, naming it El Charro in honor of the "gentlemen horsemen" of Mexico – "los charros". Our roadtrips so far do not bring us to the El Charro, but the Mother Road, US-66, does. Often referred to as simply "The Berghoff", the restaurant is – with its signature neon sign – a familiar sight to Chicago residents. Founded way back in 1898 by Herman Joseph Berghoff and started as a gateway through which beer could be sold. Said beer was actually of his family’s own design, with Herman and his three brothers owning a brewery from which they produced Berghoff’s Beer – a German-style beer that had its origins in Dortmund, Germany. The beer was sold for a nickel, with accompanying sandwiches being passed on a cut-throat rate of being absolutely free. While it closed briefly during a labor dispute in 2006, it’s open again today. The Berghoff holds Chicago’s No. 1 Liquor License, surviving Prohibition by serving root beer, as so many brewers around the country did. If you just can’t find enough good food along our upcoming US-6 Roadtrip-’62 ™ , this would be just a one day side trip away as we skirt the Chicago area. The last of the lot and by far the most alliterative of all, Louis’ Lunch is found in New Haven, Connecticut, having been started in 1895. Louis’ Lunch carries with it rumors that it is the first place in America to have ever sold a hamburger! The story goes that back in 1900, a local businessman was in a hurry for some reason or another and asked for some food "to go" from the counter-staff. This perhaps somewhat odd request resulted in Louis Lassen – he whom the Lunch belonged to – sandwiching a burger between two pieces of bread, thus paving the way for delicious burger-y goodness for many centuries to come. Not much has changed since those days of a bygone era, as Louis’ Lunch still seems to mainly consist of delightful burgers, prepared in the traditional ways of their forefathers and even going as far as to have them cooked on cast-iron stoves from 1898. Authentic! Due to other development in New Haven, Louis’ has been forced to move twice, most recently in 1975, so it’s not what we would have seen in 1962. It’s been featured on both the Travel Channel and the Food Network’s "The Best Thing I Ever Ate." The burgers are served on toast, because that’s the way the first ones were served: hamburger buns had not yet been invented!